Change happens. Every business environment requires continuously changing strategies, processes, tools and skills. Implementing a continuous improvement program is one way a company can harness their response to change and create competitive advantage. As companies launch continuous improvement programs, they need to have a plan. Effective programs require the following 5 elements leading to successful and sustainable efforts. Align continuous improvement with strategic objectives Continuous improvement (“CI”) should not be considered a standalone initiative or self-contained goal; it must align with strategic objectives. When launching a continuous improvement program, aim to make an impact quickly for credibility and momentum. Pick your battles and don’t try to tackle all objectives at once. Always use strategic objectives as the litmus test for deciding if something should be done and how it should be done. Don’t overdo process excellence at outset; this is an evolutionary process Understand the base you are operating from. Most organizations don’t have the skills or resources to launch a major continuous improvement program. After aligning the CI program, the company needs to start small and gain some momentum by working on projects that deal with strategic and operating gaps. Projects addressing gaps will have high visibility and high impact. Try doing projects in every functional area utilizing the process owners and key influencers so that people know what to expect and how to deal with continuous improvement. Remember Plan-Do-Check-Adjust on your CI roadmap. Integrate continuous improvement into a culture of strategic execution Continuous improvement and change management go hand in hand as shown below. There is prep work to be done in order to create the basis for sustaining a program that is designed to support the long terms needs of the company. High performance cultures require a clear strategy. Clarify your vision, mission and values, and set objectives throughout the organization. WORK on your culture, and communicate, communicate, communicate! It is important to remember that the organization is a very important consideration for continuous improvement. They need to have the right direction, the right tools and the right support. Blend the best practices from the different methodologies Focusing on one methodology for continuous improvement can limit progress, diminish innovation and restrain the organization’s ability to realize its full continuous improvement potential. Use the best tool for the activity picking from Six Sigma, Lean, Kaizen, Value Stream Mapping, business process re-engineering, and other techniques to deliver results. It is important to understand the tools that are required for each type of project. More often than not, Kaizen will be the very first tool you use to implement your quick successes. Focus on data, not emotions No more “We have always done it that way”. Embrace the discipline of the process and the rigor of data-driven decisions. Emphasize measures and metrics. Hold people accountable. This will become your new culture. Remember that the company’s strategy and data are the only things used justify projects and measure their success. Continuous Improvement Assessment which will provide you with an understanding of the operating challenges a continuous improvement program will face. Organizational Assessment which will provide insight the appropriate functional design and required skill sets required to successfully implement and sustain a continuous improvement program. Making the Case: Even a great idea requires a business case that demonstrates the objectives, expected outcomes and ROI. 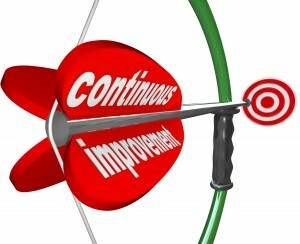 Sustaining a Continuous Improvement Program: The first 4 steps are easy. A sustainability plan will outline how the program will be integrated into the cultural fabric of the company and all of its stakeholders. We have seen a lot of programs come and go. That result is usually caused by a lack of Continuous Improvement discipline throughout the organization, which is often the result of senior management losing interest. Don’t start a program if you aren’t willing to do the upfront planning and make it part of a culture of strategic execution. Group50 has implemented Continuous Improvement programs in many companies ranging from Fortune 50 to small privately held ones. There is a process and we can share it with you as part of the first step in your Continuous Improvement journey, evaluating your existing program or redirecting and invigorating it..
About the Author: Jim Gitney is the CEO and Founder of Group50® Consulting, a 13 year old consulting firm focused on working with middle market companies to significantly improve their productivity by leveraging people, process and technology as part of a company’s strategic plan. He was a member of GE’s Quality Council, part of the team that developed and implemented Black & Decker’s Total Quality Initiative, has led or participated in over 125 Kaizen events and is considered an expert in Continuous Improvement. Group50 consists of consultants who have spent their careers in corporate America learning how to optimize businesses. When you involve your employees, you will win their commitment. You addressed the fundamental principles which have been overshadowed in recent years by the perceived need to select a single approach such as LEAN, Six Sigma, etc. It is essential for organizations to change the culture first ….from the top level! And, yes, a focus on teamwork is a must. It all goes back to Deming’s principles.